Unenclosed frontage in August: ‘wayleave’ runs left to centre. Miss Patricia Davies, the first Headmistress I worked under at Church High, is undoubtedly the person who moulded me most as a young teacher. So much so that we are still in touch to this very day. From our Archive, it seems some of the first correspondence Tricia had to deal with on taking up her new role was to reply to a letter sent to her predecessor, Miss Lewis, in September 1974 from Tom Lind, Consultant Obstetrician, at the Princess Maternity Hospital. The query? Welcome to the thorny issue of the ‘wayleave’. Tricia’s reply ends: ‘If you have any further questions about the footpath, please do not hesitate to get in touch with me.’ That was then, but this is now. Miss Davies at her desk c1980. I sat in the chair on the left for my interview and remember the Thomas Hardy-esque pencil sketch on the wall very well. The monstrosity to the right is how the timetable was planned before we had computers. As early as 2015, I was asked about the footpath in question. While we worked on the Tankerville site at Church High, it wouldn’t have crossed anyone’s mind to question our right of access via the side footpath to the playing field beyond. True, there was a gate to pass through when you left the School grounds to walk past the Princess Mary Hospital, which became a private housing complex in 1993. It’s a bit disorientating without the tall fence on the right hand side, but this was the pathway we used to get to the field (above). 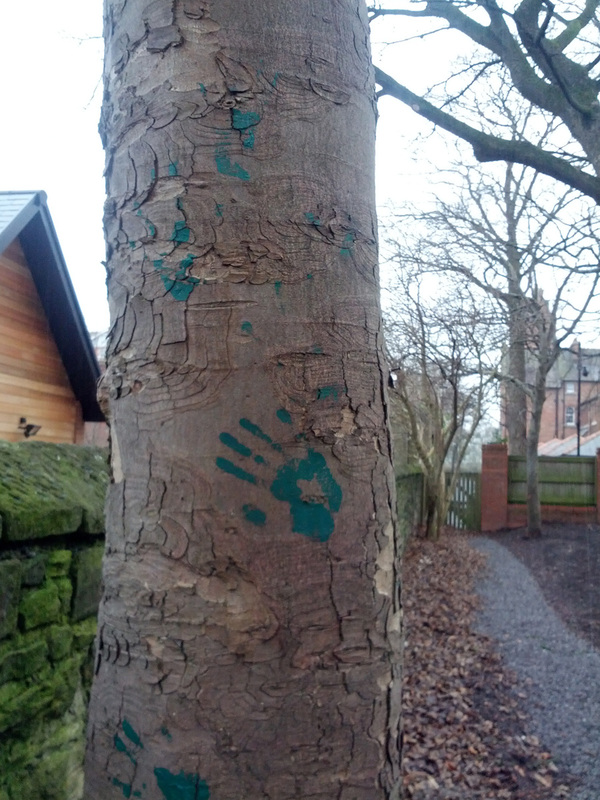 And no, I really don’t know how these green handprints got onto the trees in the image below. If anyone does know, please do tell! However, the fact the gate was always open may mean some people won’t remember it at all. But it was there. Now it is firmly closed. The present day gateway leading to Princess Mary Court. Which is how I ended up requesting item E.NC17/1/12/10 from the Church High Archives at The Discovery Museum in August 2016: ‘Documents relating to the acquisition of land in Tankerville Gardens for the use of the school, the leasing of land for the erection of a new junior school and the sale of the school playing fields in Reid Park Road’. A hefty file covering a period from 30 October 1958 – 5 October 1974. And very interesting it all was too. The paperwork makes clear that an agreement between Church High and the University, who formerly owned the Princess Mary land, was in existence prior to 1958 when King’s College were planning to build a Moor Edge Hostel (along with a path running north of Church High’s boundary wall) and continued until we left the site in July 2014. The hostel was never built, but the right of way agreement remained. Such a useful short-cut. 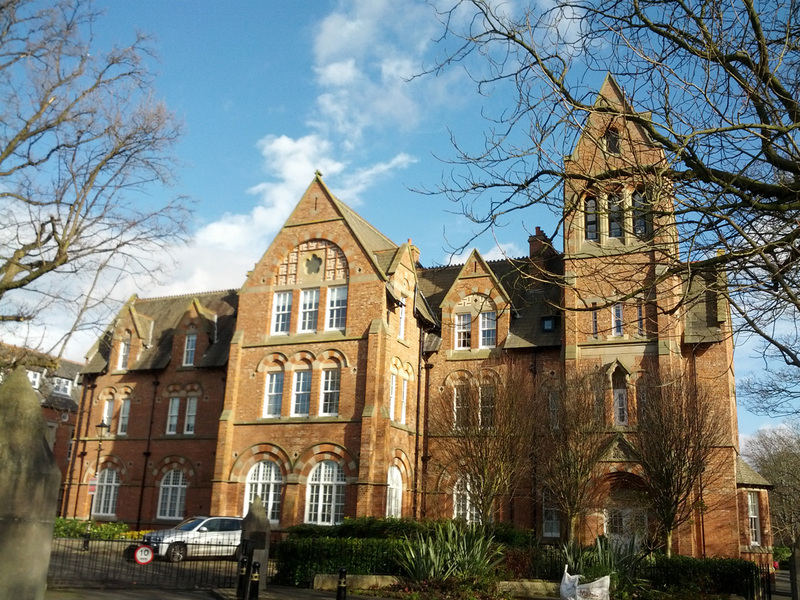 The Princess Mary building began its life, you may recall, as The Northern Counties Orphanage, made up of two separate institutions on the Moor Edge site: the Abbot Memorial Building, constructed in 1867 to accommodate 60 girls, followed by the Jane Philipson Memorial Building in 1878 to allow boys to be housed on the site. In the same year as Newcastle High School was founded in Jesmond Road, 1885, the Adamson Memorial Chapel was built to link the two orphanages. Do look at the weblinks, if you can find the time; the social history of Moor Edge is fascinating. 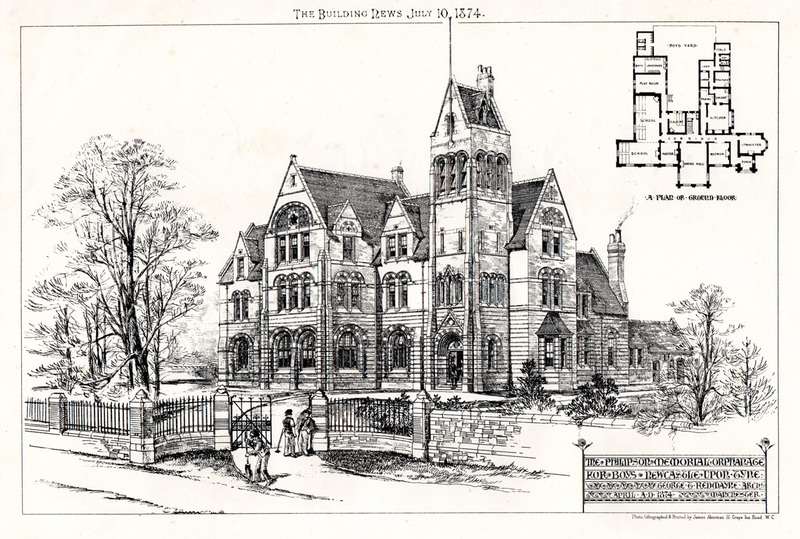 One of the first artefacts I bought online was an architect’s sketch (above) of the Philipson Memorial Orphanage Boys Building, first published in ‘The Building News’ in 1874. I photographed the very same building myself in February 2017. An important place for me, as I was born inside there! 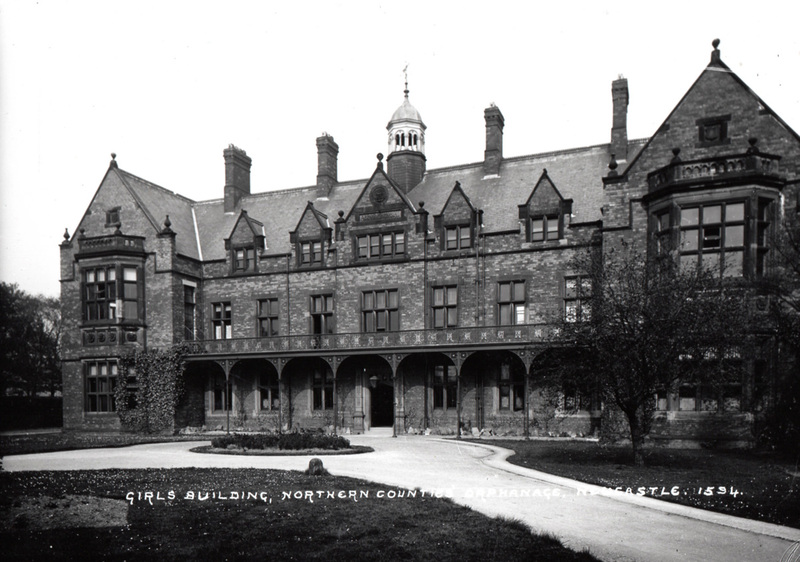 A more recent purchase was this 1920s photo of the Abbot Memorial Orphanage Girls Building, part of a disbanded Newcastle Libraries’ Local Studies collection. 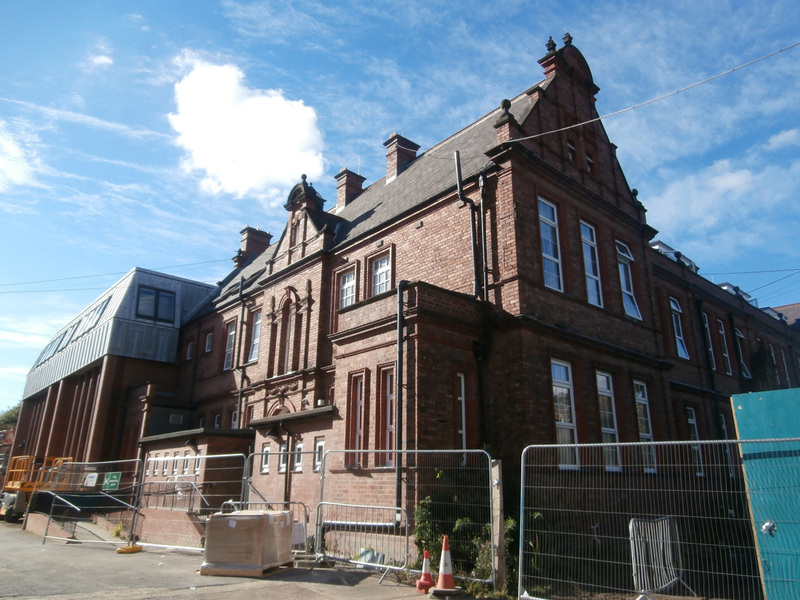 One of the architectural aims for the 1889 Newcastle High School building was for it to blend in with the adjoining Moor Edge properties. I’m sure you can see some similarities here – not least the tower. 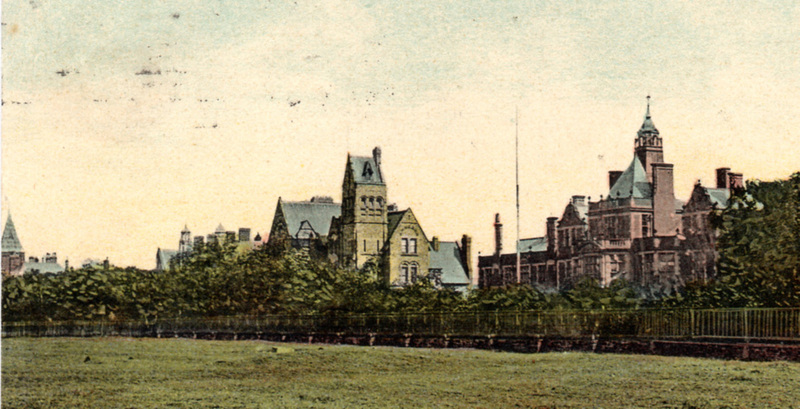 This rare 1907 postcard features all three Moor Edge Institutions (from extreme left to right, the Northern Counties Deaf & Dumb Institute, the Abbot Memorial Girls’ Orphanage, the Philipson Memorial Boys’ Orphanage and the Fleming Memorial Hospital), all buildings still complete with their towers. For over 20 years after the end of World War II, Church High had ‘a longstanding and friendly but unofficial arrangement’ with King’s College, University of Durham, allowing use of part of the land which once served as the Orphanage Garden as a ‘playing area for children.’ The University themselves leased the entire Orphanage plot from the St Mary Magdalene and Holy Jesus Charity. Thanks to P.C.’s memoir, ‘The Glory and Freshness of a Dream’ in the Jubilee history, we know that Hockey was played there before the playing fields on Reid Park Road were acquired. Again in a 1961 letter, the Bursar of King’s College, refers to the land as their ‘building site’ which Church High is ‘temporarily using as a playing field’ when the issues of litter and people exercising their dogs on the land were raised. 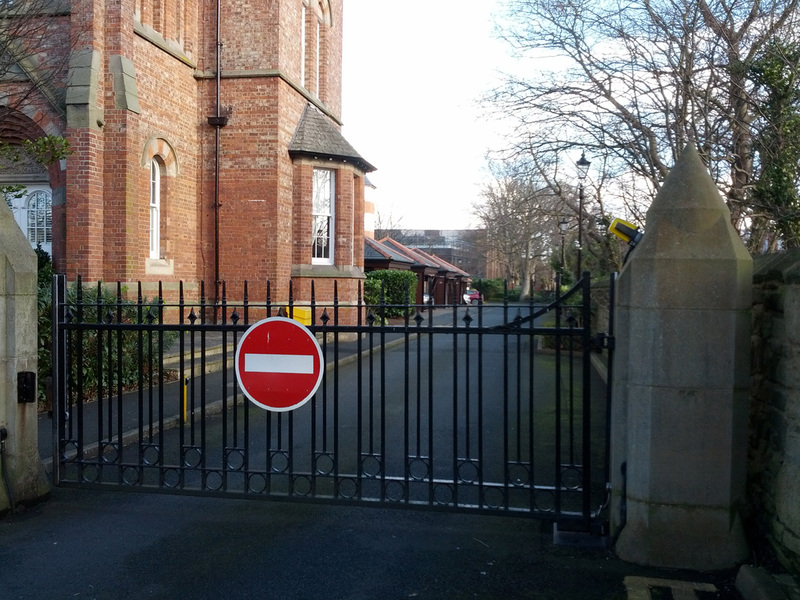 The compromise reached was to fence off the eastern edge along Tankerville Terrace including a gate to the side of the School, with keys provided for both Church High and the Princess Mary. The portion of original Princess Mary Maternity Hospital land shaded blue was purchased by Church High in 1971. The far right of this open area, lined with trees, was known locally as Tankerville Terrace Gardens. 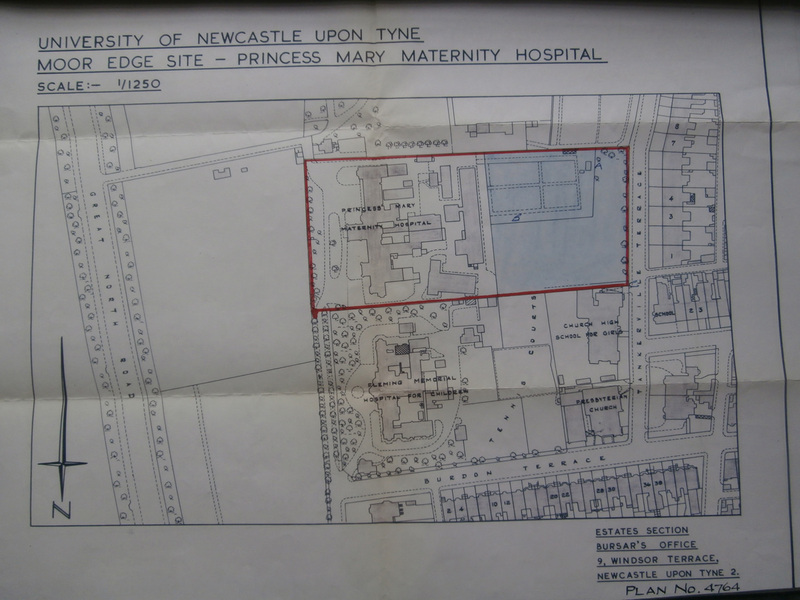 [Image created in June 1969 to show the land leased by Newcastle University from the St Mary Magdalene Trustees. Used courtesy of T&W Archives]. 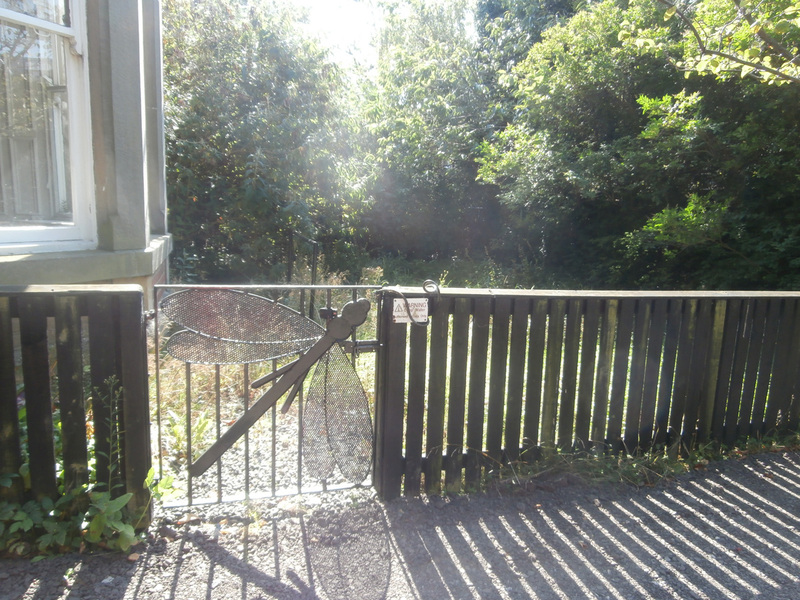 I mentioned the side footpath and the longstanding ‘right of way’ agreement to Wates’ Ken Fiksen on the afternoon of 22nd August. This was news to him. 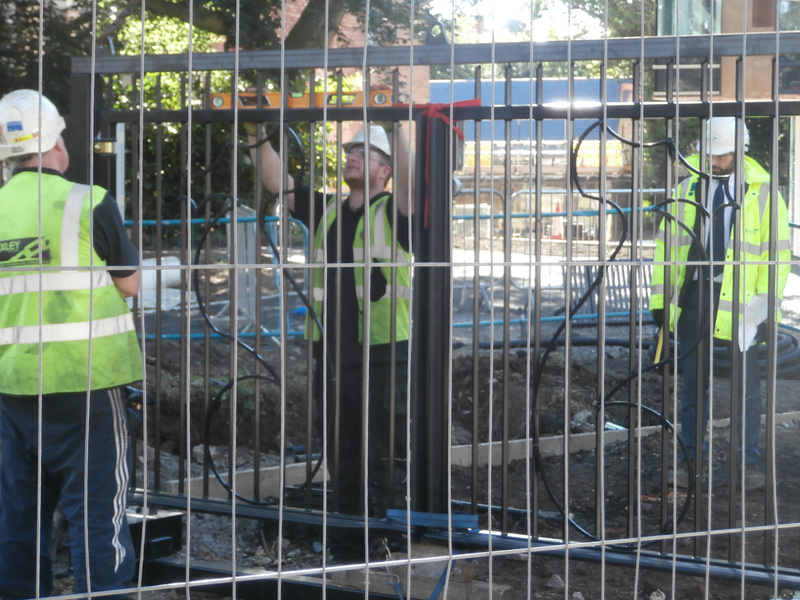 Shaking his head, he told me the pathway fencing had already been removed (which I already knew) and they were now in the process of fencing off the whole site. But there would definitely be a ‘wayleave’ along the side of the building, he said. 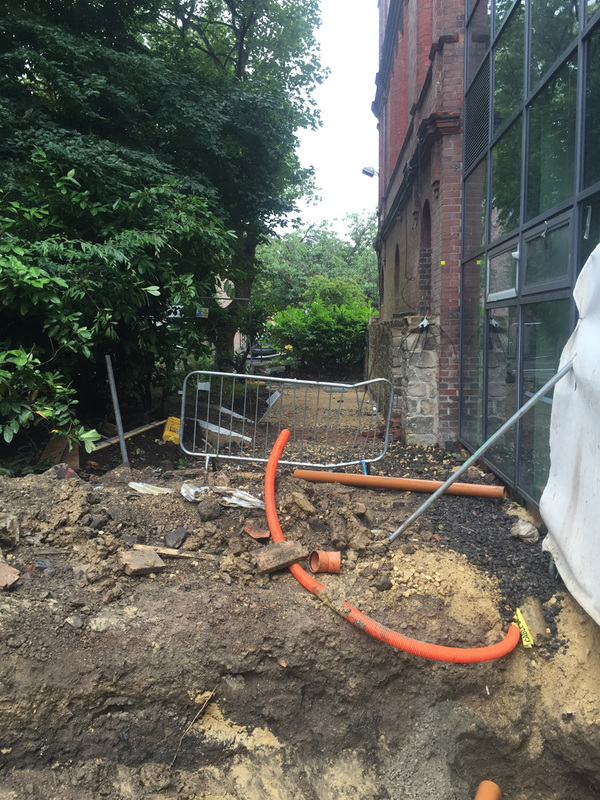 This, he explained, was an agreement by which the property owner gives a service provider or utilities company the right to install pipe or cable passing through or over the owner’s property. As a number of Giuseppe’s photographs clearly show, there certainly were a lot of pipes and utility access points installed in that area. 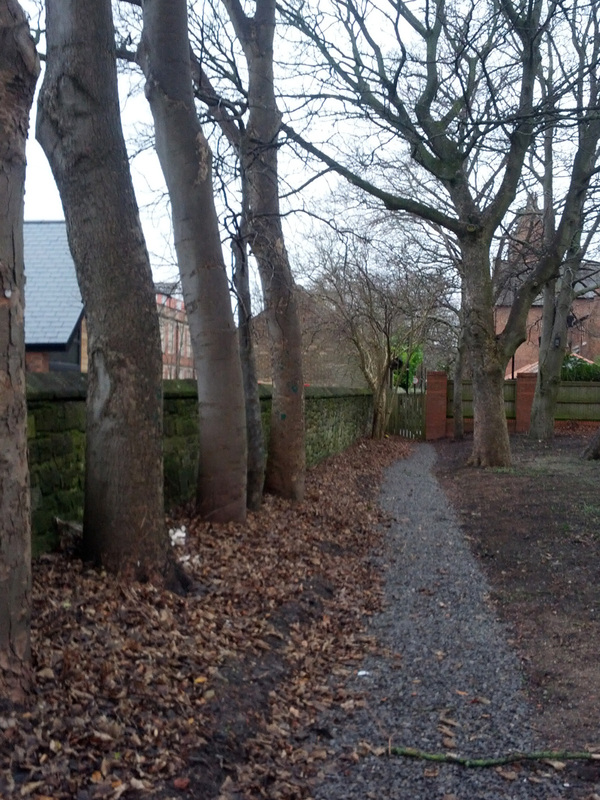 It is hard to recognise that old footpath now. The same area viewed from the New Build. Our attention then turned to discussing the brand-new, electronic pedestrian gate, as yet to be unloaded from the lorry, you may recall. 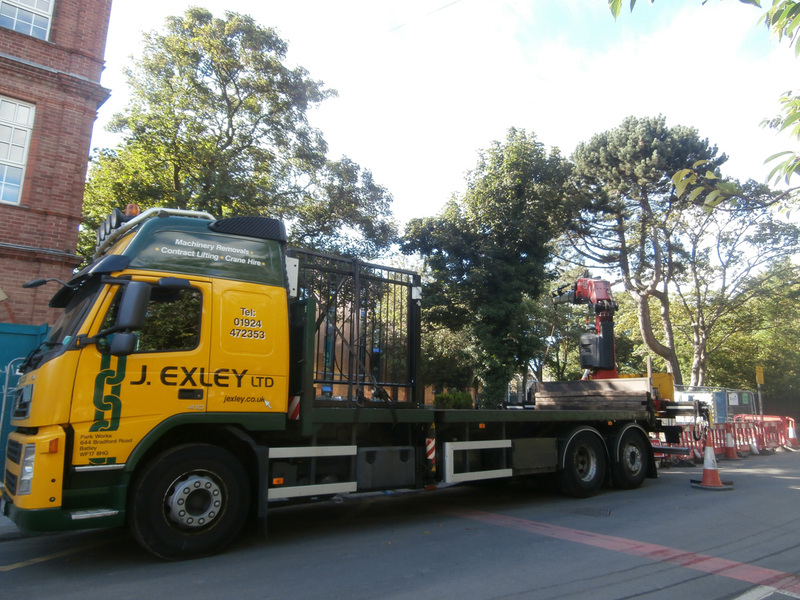 The sea-horse pedestrian gateway still sitting atop the lorry. 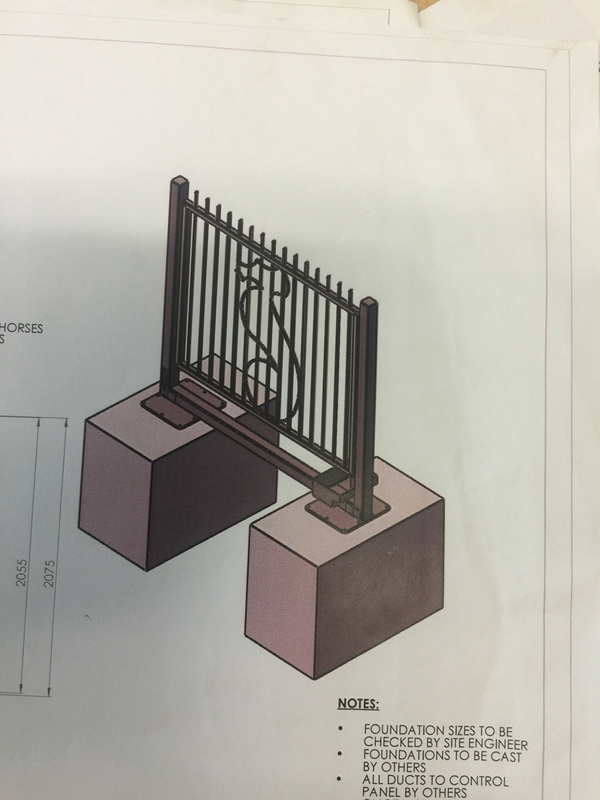 The smaller gate’s appearance was no surprise at all to me, as Giuseppe had already included various working sketches of it in his download feed. 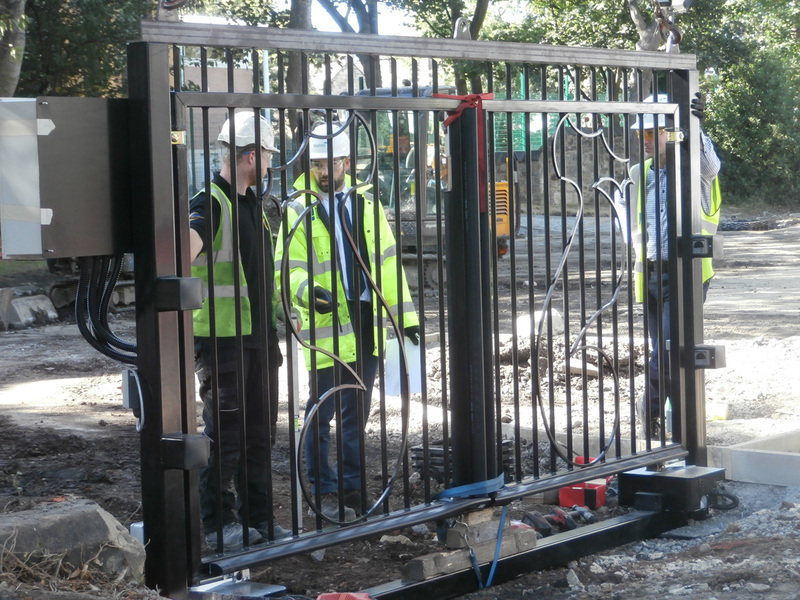 Both black powder-coated galvanised steel auto gates were constructed by GMC Fabrication Services and were being installed by Davison Fencing. 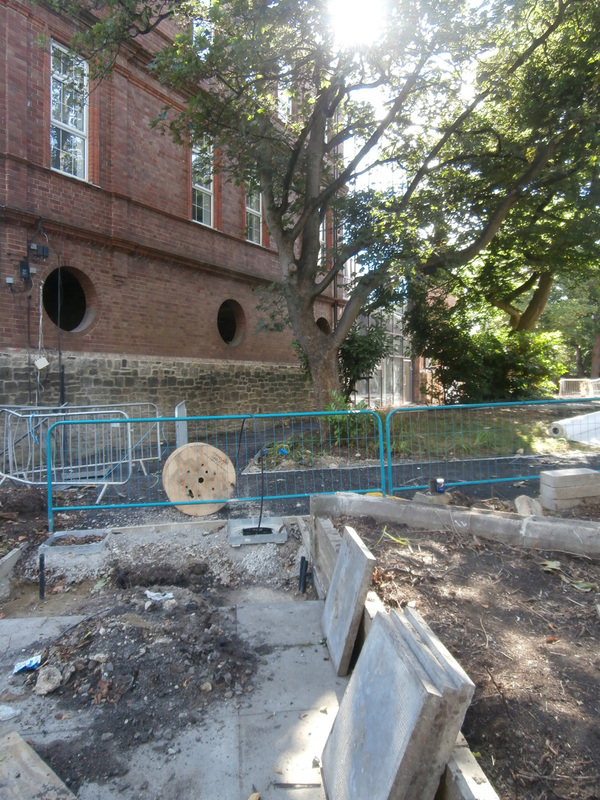 Presumably the concrete foundations for the single-leaf auto gate were also already in place. 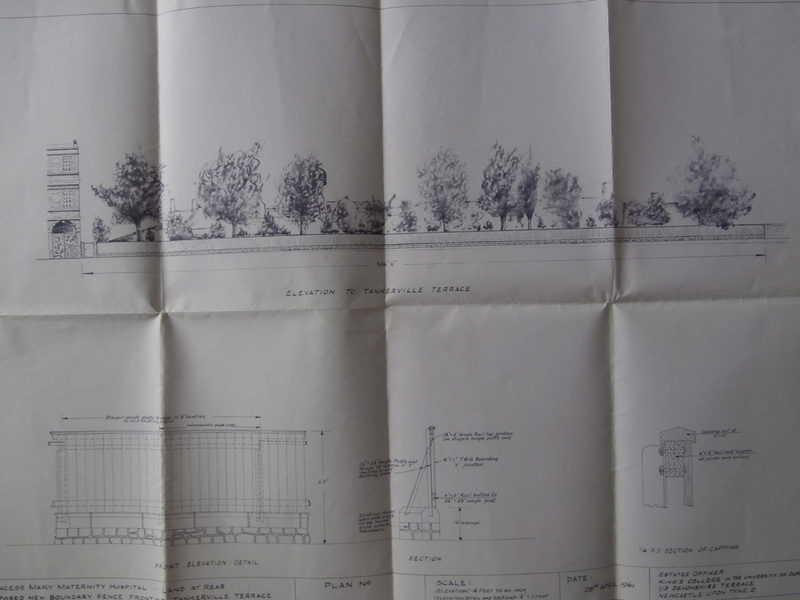 Giuseppe’s building sketches for the single-leaf pedestrian gate & foundation columns. 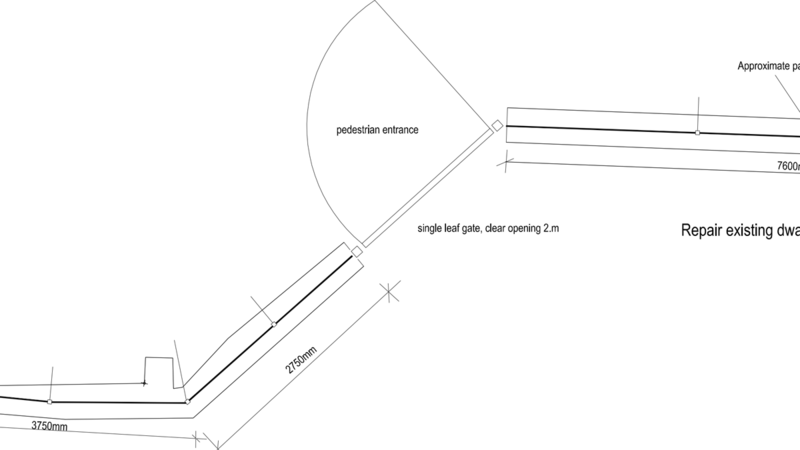 As you already know, I wasn’t able to stay to see the new pedestrian gate being installed, but I located its proposed position before I left. 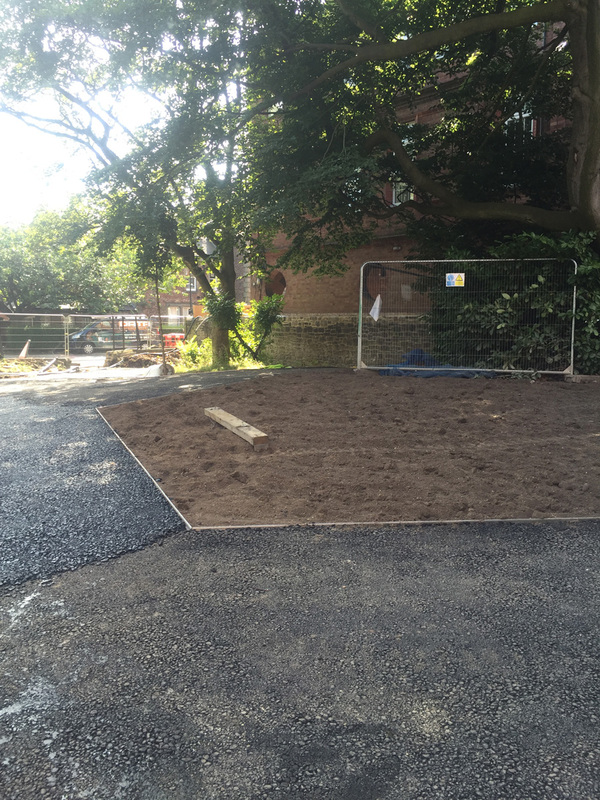 The concrete foundations of the smaller gate. 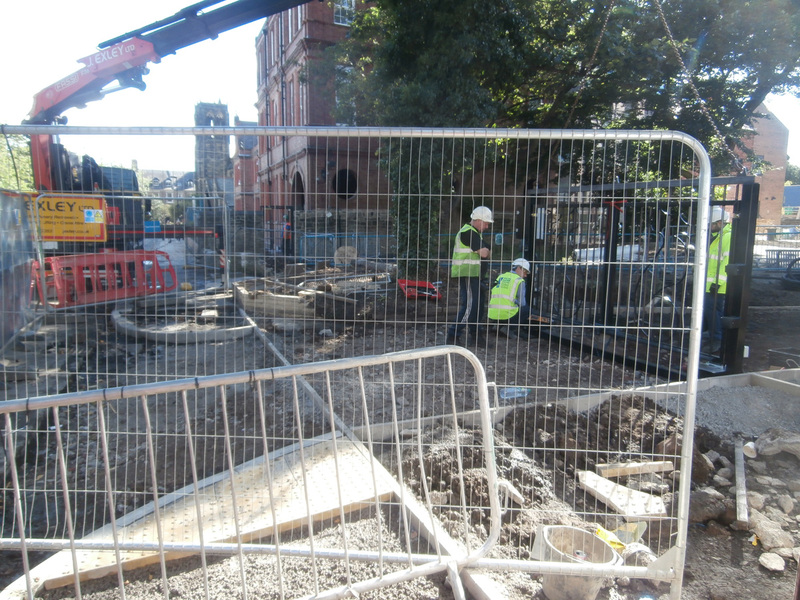 An earlier photograph of Giuseppe’s shows the ground being cleared for the new pedestrian gateway. 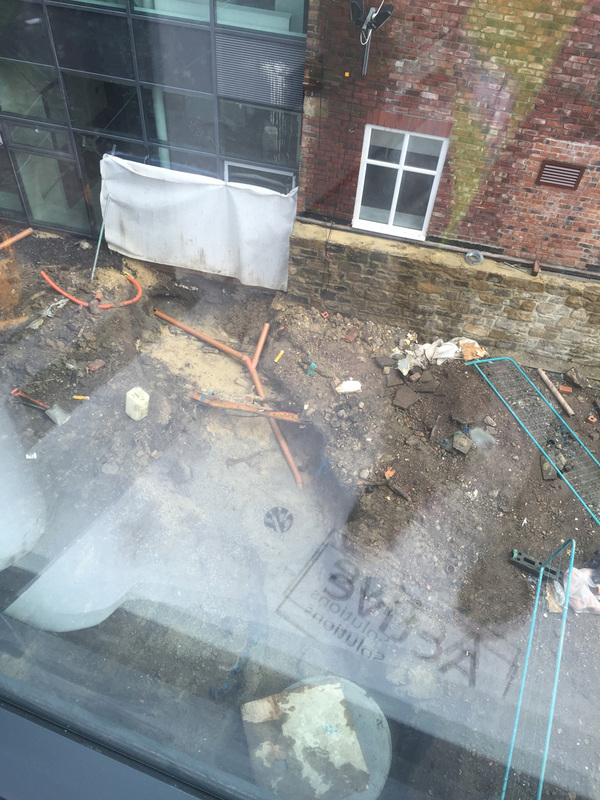 This used to be a slightly raised bedding area containing shrubs and greenery, you may recall. 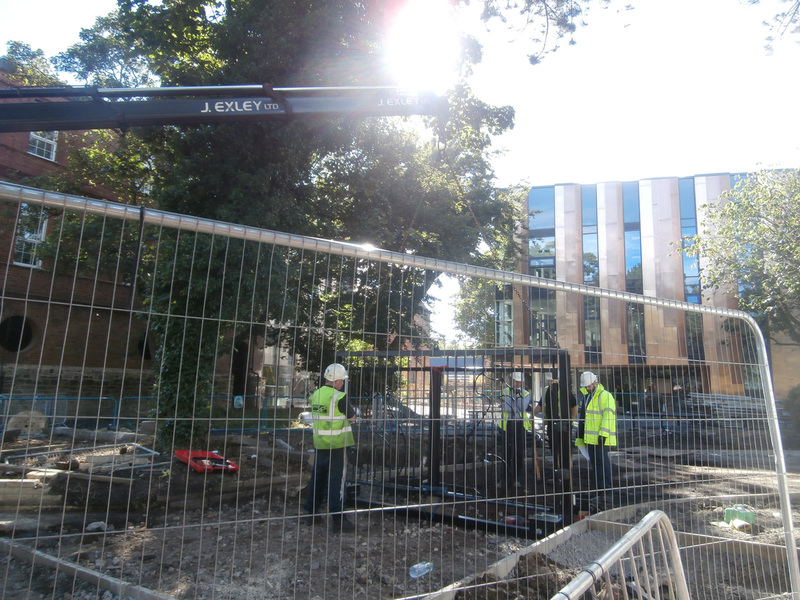 Clearing the way for the new electronic pedestrian gateway. 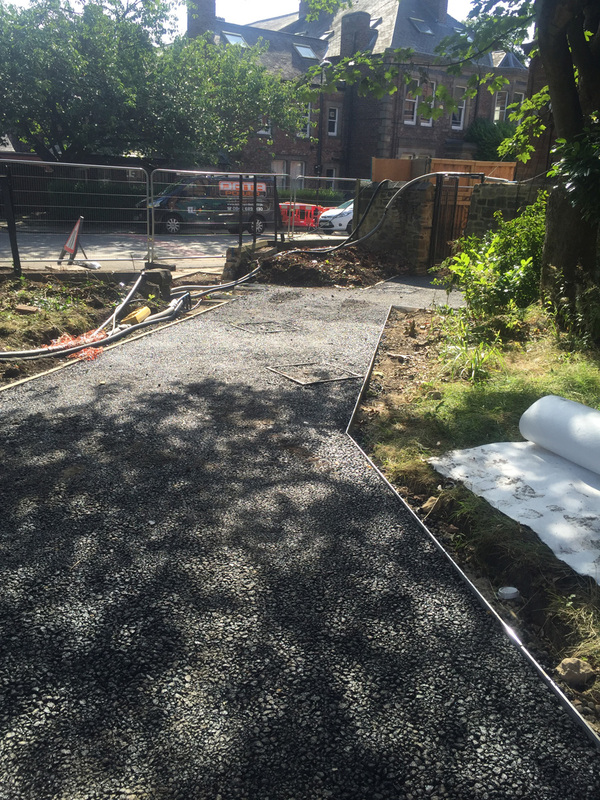 As this will be the last post I shall write in 2017, it seems fitting to end with pictures of the newest pathway on the Tankerville site. It’s a more circuitous pathway than the old one, true, but then life is all about the journey and not the destination, I am sure you will agree. 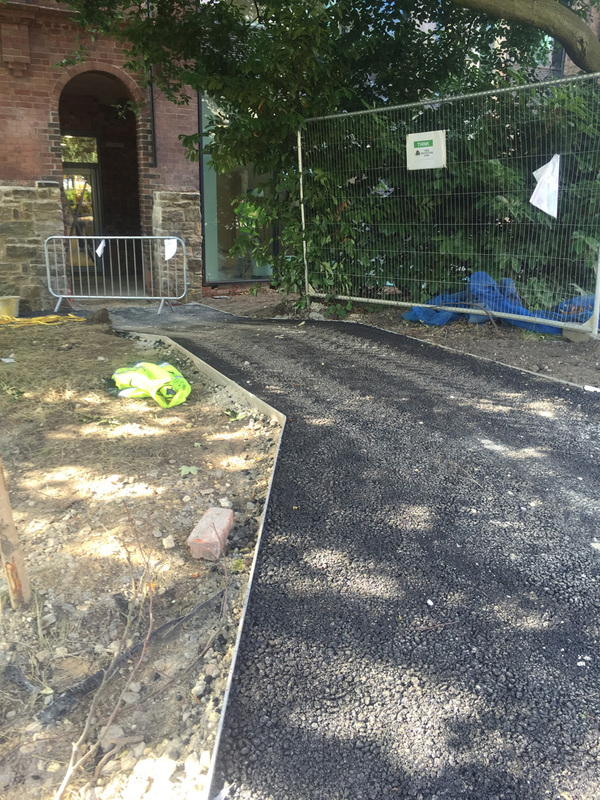 The new path to the pedestrian gate from the new side entrance to the Old Building. As I wish you all a Happy New Year, I will finish off 2017, a year that hasn’t been the easiest for me personally, with one of my favourite Bible quotations. It is from Isaiah 43: 19 and offers us all a promise: ‘Behold, I will do a new thing; now shall it spring forth; shall ye not know it? I will even make a way in the wilderness, and rivers in the desert.’ Newcastle High School girls may now have to go the long way round to the Moor Edge Intake field, but I hope 2018 is a good one for all. Merry Christmas everyone. Creativity and Christmas always went hand in hand at Church High. 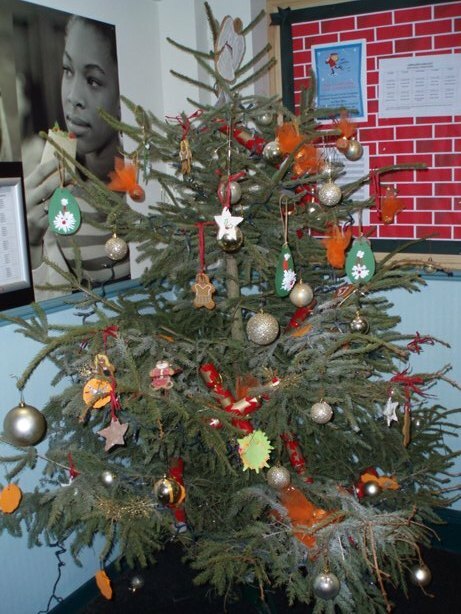 By the end of the Autumn term, classrooms were generally festooned with home-made decorations – as long as they didn’t hanging from light fittings! – and there would invariably have been a number of festive competitions in subject specific areas: Christmas poems in RS for the Carol Service and Christmas cakes in Home Economics standing out most in my mind. 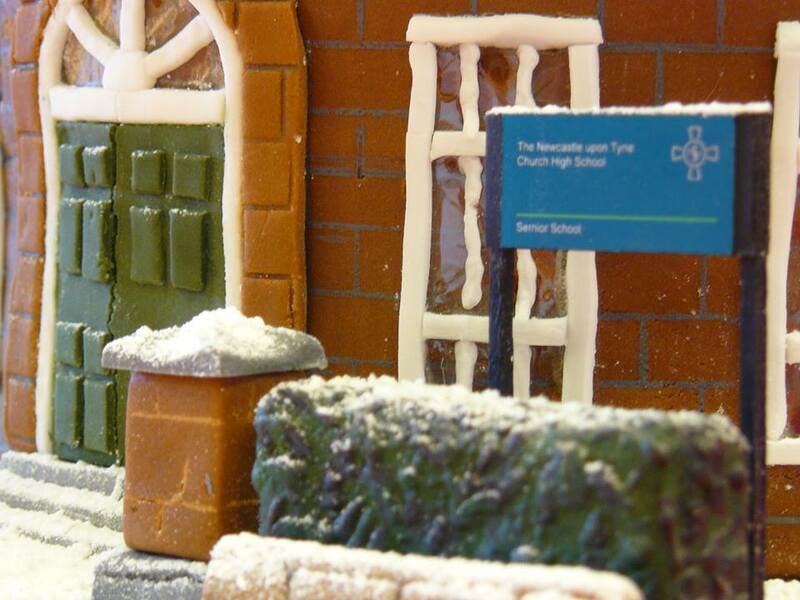 In the final year of the School’s life, Macie Gahari gained a special prize in the December 2013 competition for her cake celebrating Church High. It was indeed a very special cake (pictured above and below). 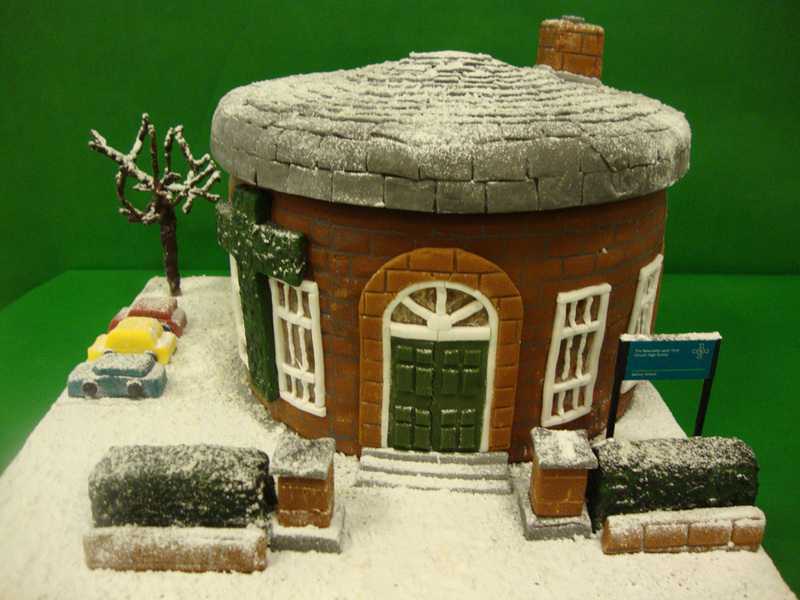 In recent years, after the Houses were re-established, the corridors, Hall and LRC became another source of Christmas creativity. Around about Christmas Fayre time, an inter-house Christmas tree competition was held, the trees always decorated in house colours. Oddly inventive decorations often appeared at that time, you may remember, in the traditional colours white, red, orange and blue. 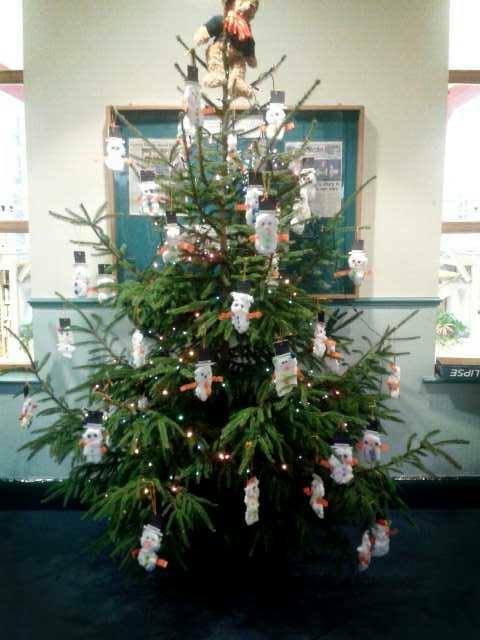 The Dunstanburgh (White) House tree graced the Entrance Hall in December 2013. 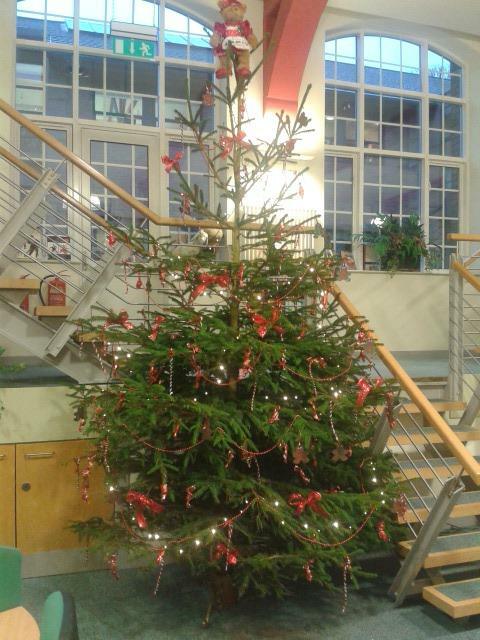 Walkworth (Red) House tree was in the LRC. 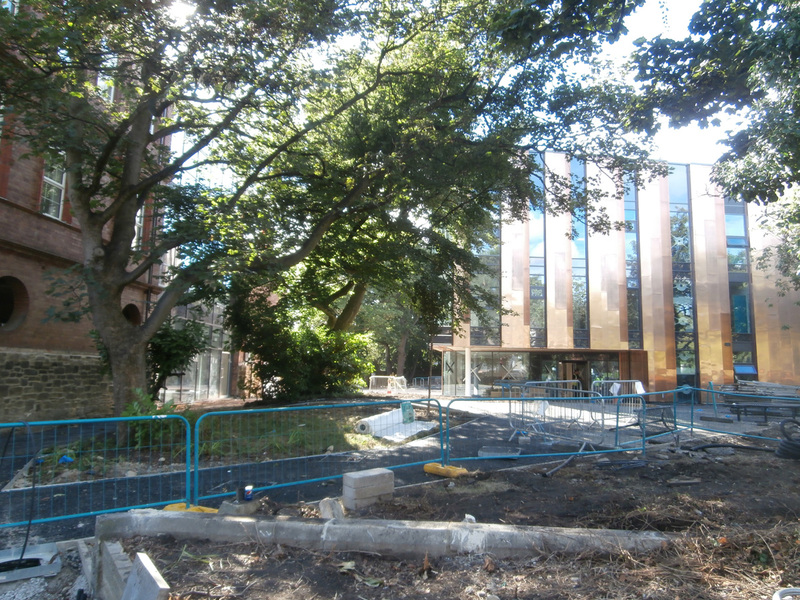 The Bamburgh (Orange) House tree was just to the left of the Dining Hall door in 2013. The Alnwick (Blue) House tree completed the stage curtains in the Hall very well that year. 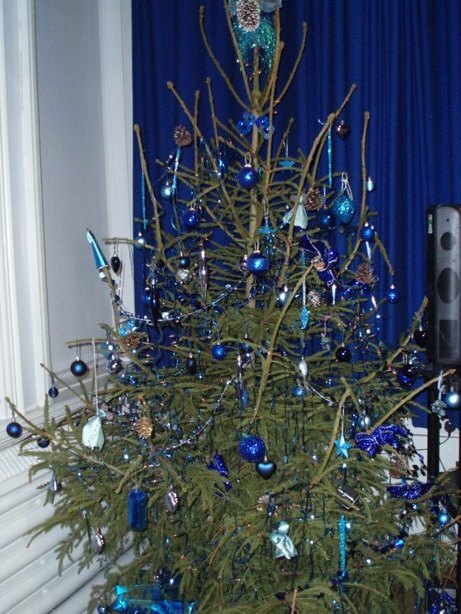 I always loved those Christmas trees, even if they were often rather bereft of needles by the last day of term. I also loved the School Carol Service held each year in St George’s Church, Jesmond, more recently, although in the past it rotated between two local churches. 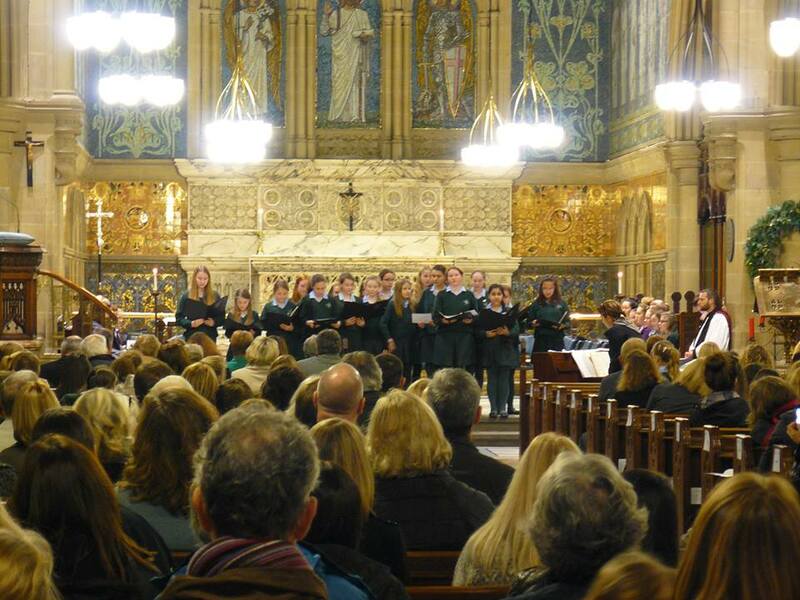 The Church High Choir singing carols against the beautiful mosaic altar back-drop of St George’s Church, Jesmond. Radio 3 listeners will know that this lyric was the inspiration for the Radio 3 Carol Competition this year. They will also know that this year’s winning composer was Bernard Trafford, until very recently Headmaster of The Royal Grammar School, Newcastle. When I heard the winner’s name announced at 10.30 am on December 22nd, I remember thinking that there couldn’t be very many Bernard Traffords in this country – and, sure enough, it turned out to be him. It seems that Bernard started off his career in education as a Music Teacher, something I wasn’t aware of when I sometimes used to pass him on Eskdale Terrace on my way to work in the mornings. 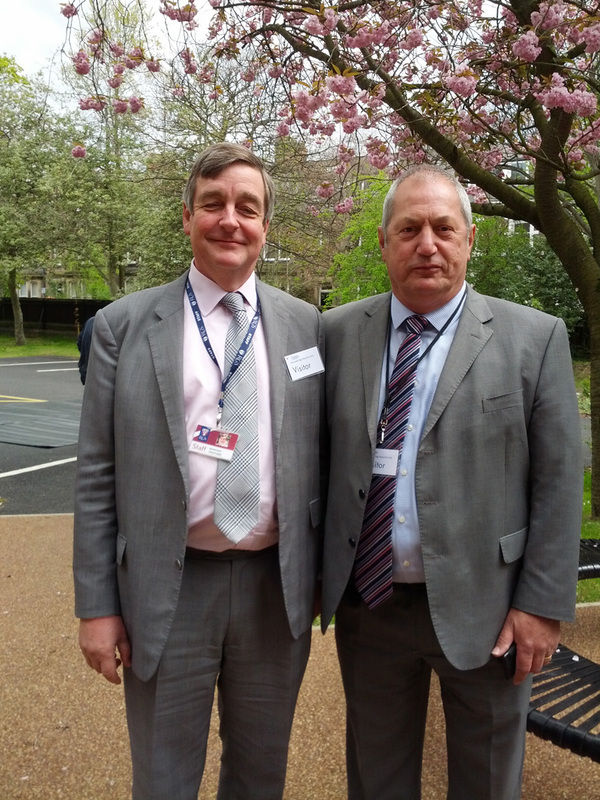 Dr Bernard Trafford (left) pictured with Wates’ Alan Andrews at the unveiling of Zoe Robinson’s seahorse statue in April 2017. Radio 3 has been playing Bernard’s composition for ‘Sir Christemas’ all day today, Christmas Day. I really like it. It’s very catchy and is a tremendous achievement for Bernard, particularly knowing it was won on a public vote. You can hear it on the Radio 3/BBC website. I last talked to Bernard in April 2017 when he attended the unveiling of Zoe Robinson’s seahorse sculpture at NHSG. It was already public knowledge by then that he would soon be retiring from RGS and, because of this, our conversation naturally took on a rather retrospective tone. I said how nice it was to see him there and we both passed comment on the beauty of the Tankerville Site that day. He went on to say that he had just been talking to Joy Gatenby and had confided to her how pleased he was that GDST had chosen Church High’s building for the new school. I agreed and smiled. By the end of the day, my smile was much wider. Indeed, it had turned into one of those deep, wry smiles that brings a twinkle to the eye whenever the event is recalled. I mentioned to someone later on that I was sad to have missed catching up with Joy only to be told she hadn’t been there. Were they sure? Yes, they were. I was completely nonplussed following my conversation with Bernard. But Bernard Trafford told me he’d spoken to her, I said. Well, Bernard must have been talking to someone else completely was the reply. I thought about this for a while. Who could he have mistaken for Joy? And then the penny dropped and my smile became wry. I would give a lot to know how GDST’s Estates Director, Christine Sillis, responded during that exchange. I am sure she was both politic and polite. 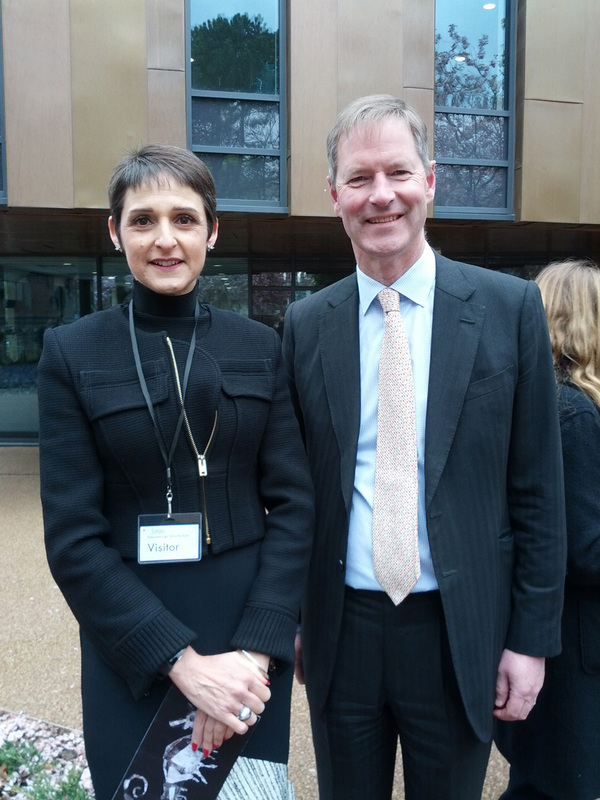 What Joy: Christine Sillis, GDST Estates Director and Tom Beardmore Gray, GDST Finance Director, at the unveiling of the NHSG seahorse. Can you see any resemblance there? It is with great sadness that I share with you the news I learned today that Mrs Norma Quince, Church High School Secretary from 1994-2004, has very recently passed away. I know a great many of you, whether as a colleague or pupil, will remember Norma’s warm personality, kindness and good humour. She will be much missed. Norma took on the role of Church High’s School Secretary in 1994 on the retirement of Mrs Elizabeth Bell. 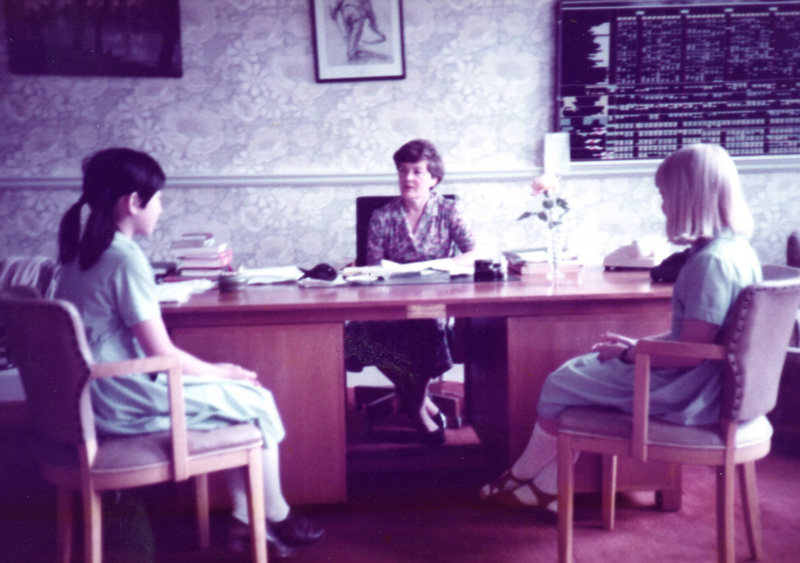 The School Secretary’s onerous duties not only involved running the School Office, but also acting as the Headmistress’ PA and supporting the Governing Body. Norma carried out these duties with great diligence, skill and discretion supporting two Headmistresses in her 10 years’ service. Her time supporting Miss Davies was short (a year and one term), as Miss Davies retired in December 1995, but she enjoyed a long working relationship with Mrs Lesley Smith, who took up the Headship in January 1996. As many of you may remember, Norma also acted as Secretary to the Church High Old Girls’/Alumnae Association until Sarah Timney took on the role of Alumnae Co-ordinator in 2000. Norma’s time working at Church High coincided with a period of great change, growth and expansion for the School. 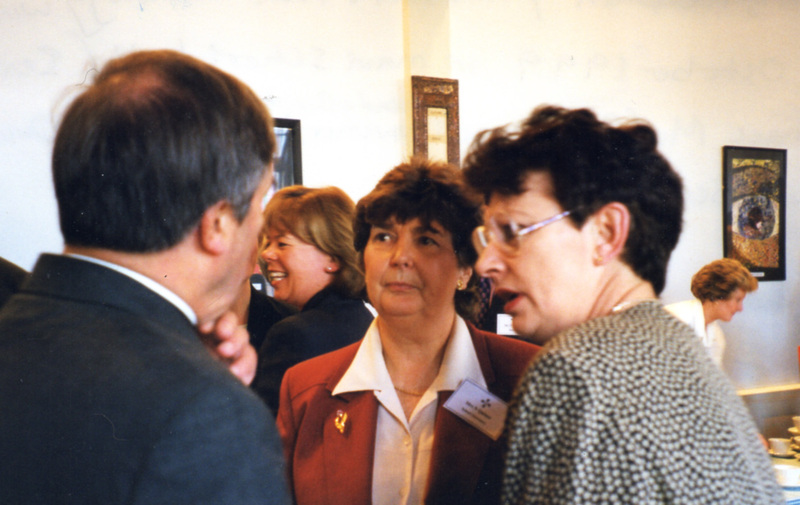 The picture at the head of this post shows her (centre) in the Hall with Governors at the Opening Reception for the Barbour Wing in 1999. Norma would also have been involved administratively in the work leading up to the unveiling of the Sport’s Hall in 2002 and the LRC in 2003. In recent years, Norma’s health had been failing a little, but that did not stop her attending the Church High Reception to celebrate the re-opening of Tankerville in September 2016 (pictured below). It was lovely to have her there with us at that special ‘family’ reunion . If you would like to attend, a funeral service to celebrate Norma’s life will take place on Thursday 21st December at 10.15 am at the West Road Crematorium, Newcastle-upon-Tyne. In the Evening Chronicle notice, a family request for flowers only has been made. Friends are also requested to meet at the crematorium where the retiring collection will be in aid of the British Heart Foundation. Norma will be greatly missed by all who knew her at Church High. 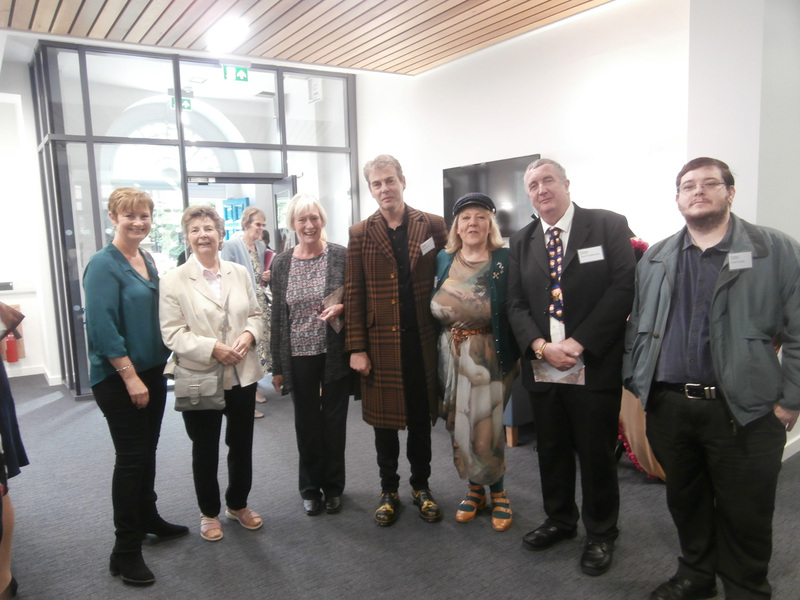 Norma (second from left) pictured in Tankerville Reception with returning Church High colleagues in September 2016. 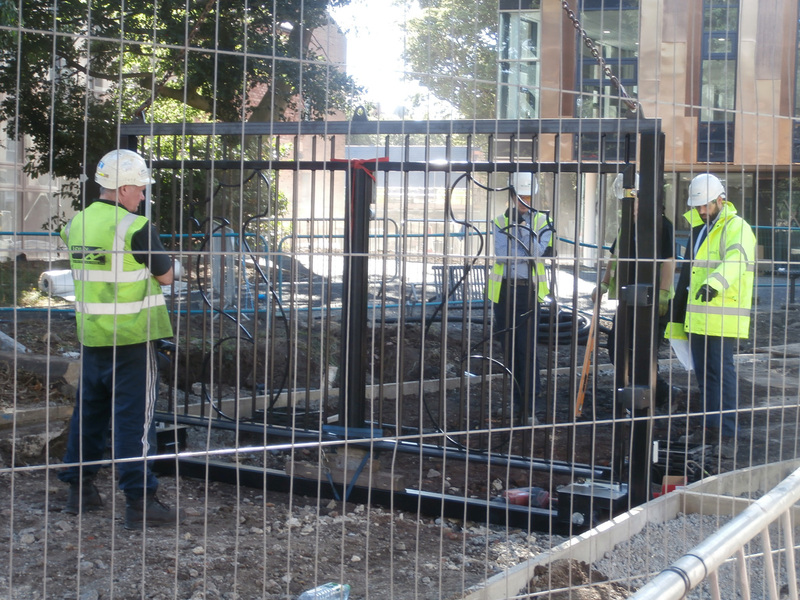 I learned recently that one of the last fundraising projects my friend Richard Berg Rust worked on in his role as Development Director for Hughes Hall, Cambridge was the commissioning of a large set of ornamental gates for the college. You may recall that I like gates and find the symbolism incorporated into ironmongery fascinating. Since the oldest Cambridge colleges all had famous gateways, such as Newnham College’s grand Pfeiffer Arch, it was felt Hughes Hall, the newest college admitted to the University, needed their own. In the same way the chrysanthemum is associated with old Church High, the marsh marigold is the oldest symbol of Hughes Hall. 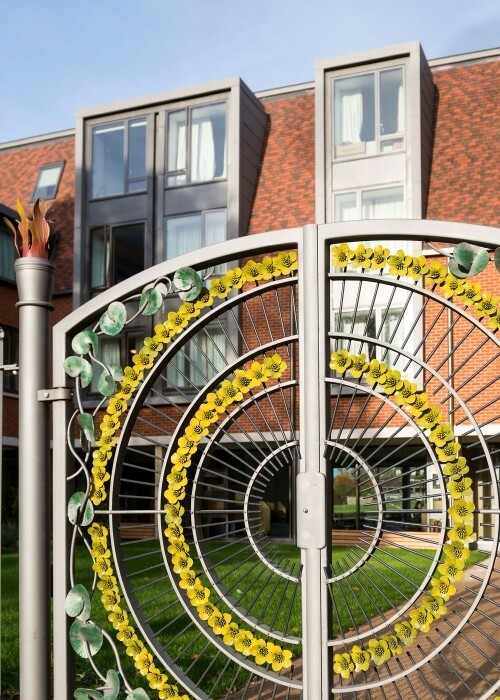 Alan Dawson’s preferred design for the gates used the flower in such a way that a new marsh marigold can be added whenever a student from a hitherto unrepresented country matriculates at Hughes. 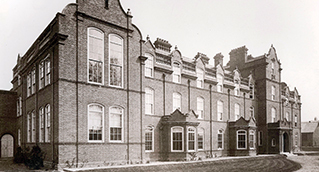 Only after Richard’s death did I learn Hughes Hall was actually founded in 1885 as the Cambridge Training College for Women to train female graduates for the teaching profession. Not only is 1885 the same year Church High was formed, the buildings are so similar too. Amazing. Such a lot we could have talked about there. The Cambridge Training College for Women, built in 1885. 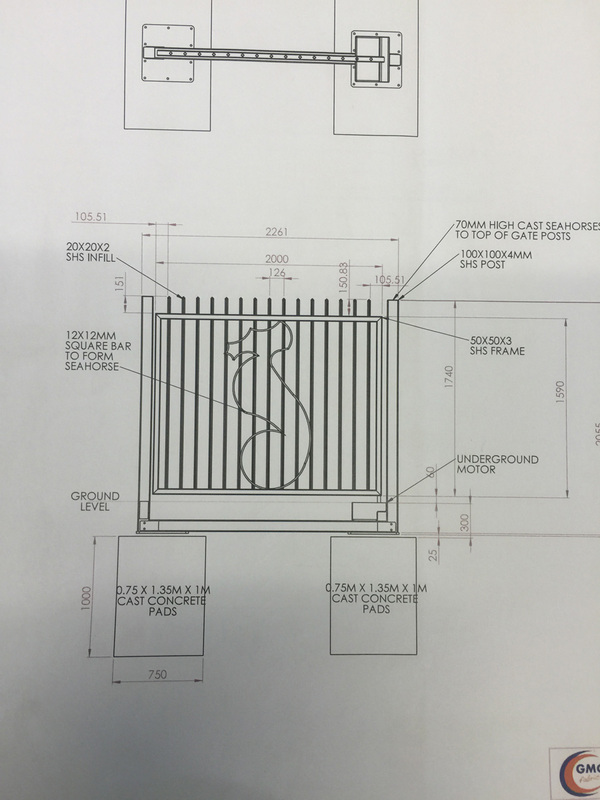 I don’t remember anyone ever talking about what the new school gates would look like. Other than noticing a reference to Davison Fencing in Giuseppe’s photographs, I didn’t give it any thought at all. Clearly an entrance to the New building grounds would be needed, but that was the last thing on my mind when I decided to visit the site on my way home from the Archives on Monday 22nd August. It had been another lovely sunny day and once again everything on Tankerville Terrace seemed very quiet that late on in the afternoon. A cotton wool cloud sails over the 1889 North Gable end. 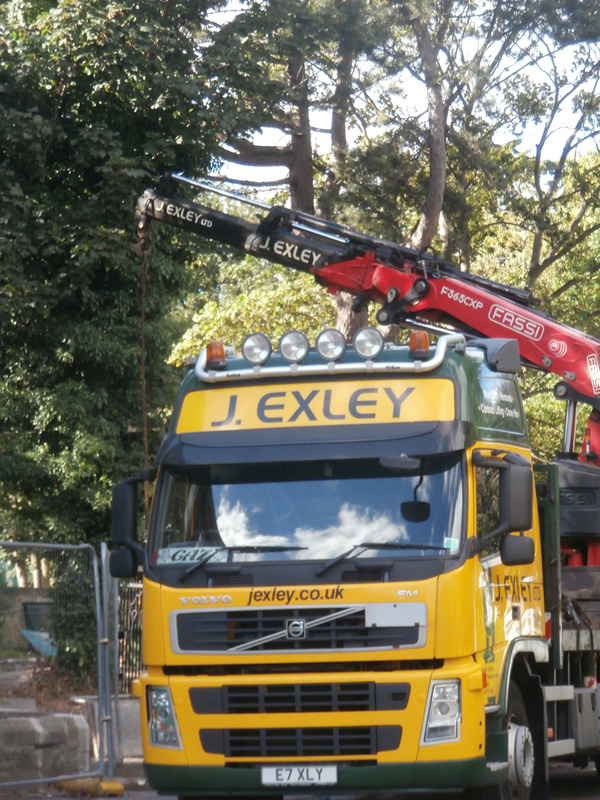 Further along the street, the presence of a very large lorry with its engine running indicated there was work still going on in the New building grounds. 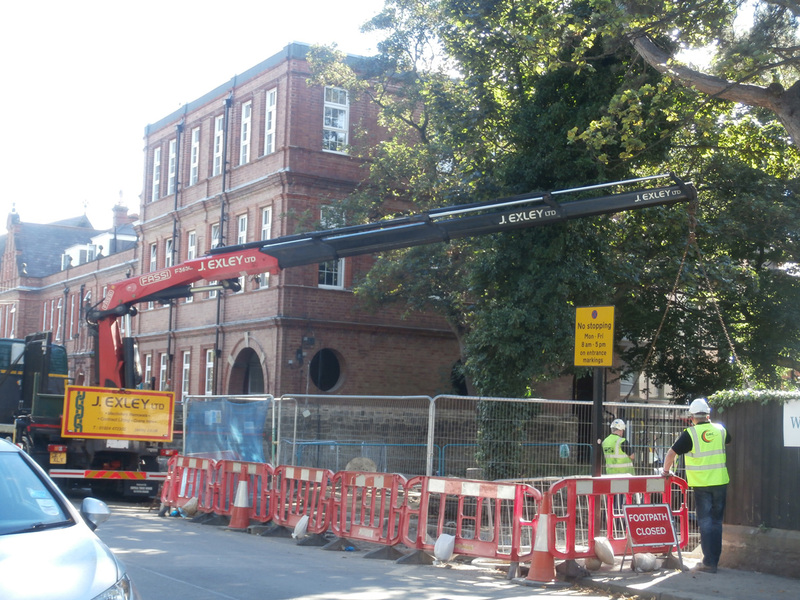 But it was only when I spotted the crane that I realised what was actually going on – and how lucky my timing was. What could that red crane arm be lifting? God does seem to have been very kind to me during this process. Call it Fate or Lady Luck if you prefer, but, not for the first time, I found myself in exactly the right place at the right time. 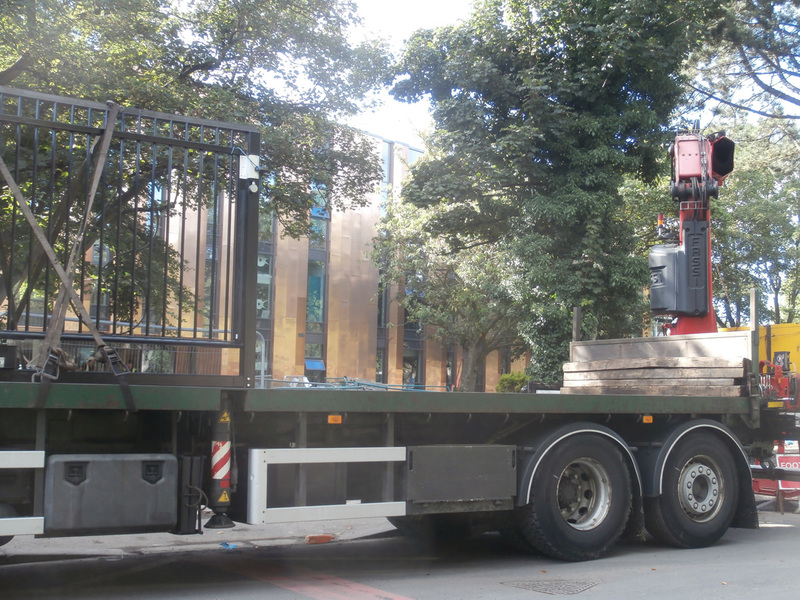 Consequently, in the same way I had turned the corner as the old carpark gates were being fork-lifted away, I skirted the lorry just in time to photograph a set of new entrance gates being winched into place. 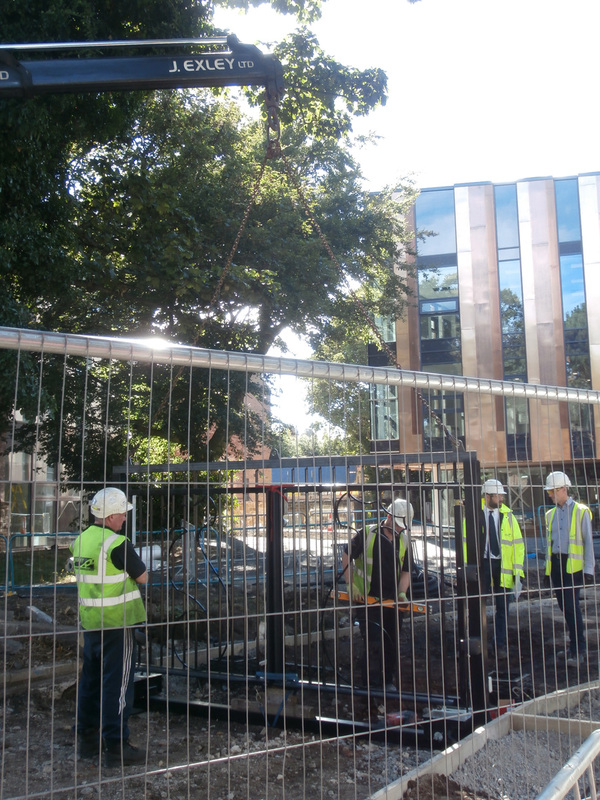 The new gates being lifted into place by a very long crane arm. I’ve always been very careful not to get in the way when I’ve visited the site with my camera and it became second nature to always stay the ‘safe side’ of my guide or, when I’ve been a bit cheeky to get a particular shot, never put myself at risk. That’s what the high vis jackets, the hard hat and boots are for, of course. 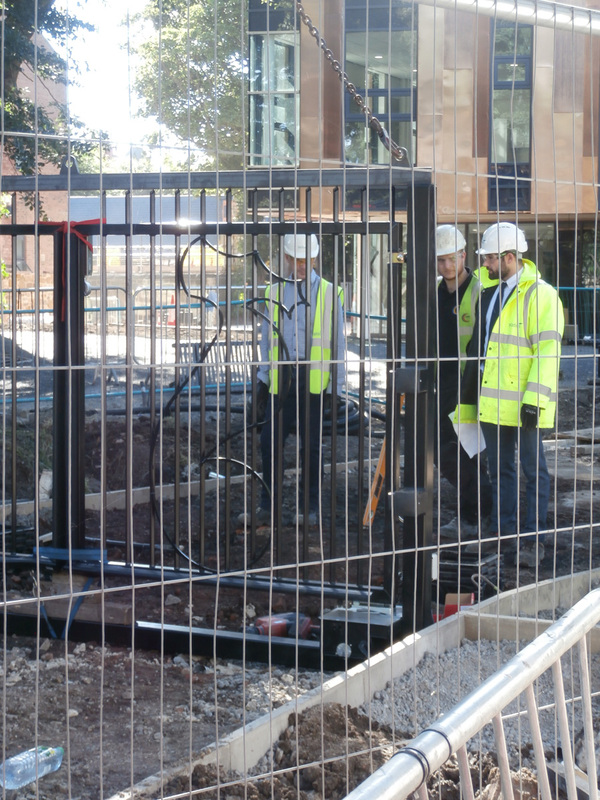 And Wates take site safety very seriously indeed. But goggles and heavy gloves do not make using a camera at all easy, so they usually ended up ‘going the journey’ as my friend/helper kindly turned a blind eye. Because of this, I’m quite proud of a lot of the photos I’ve taken all around the site over the full year and a half of the renovation work. So there was no way I was going to stay across the other side of the road now. I venture a little closer to capture my first shot of the gate. 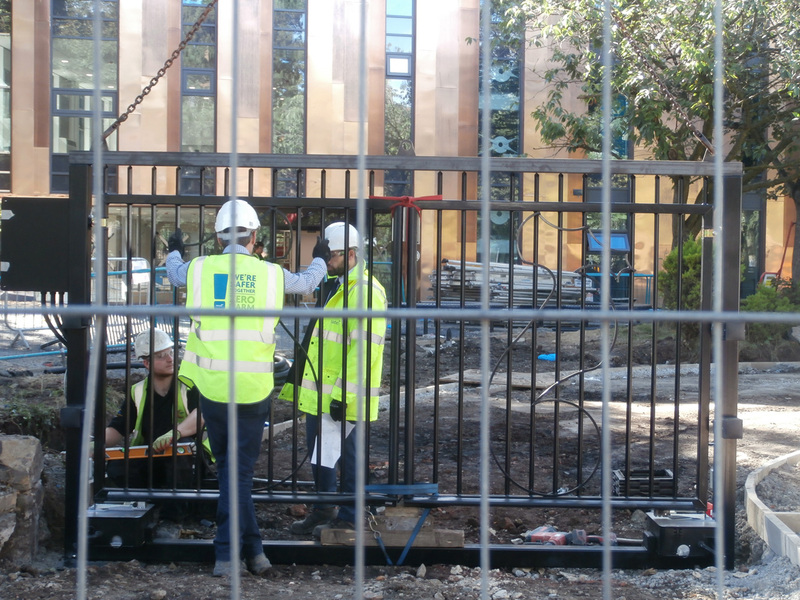 From this position, with my lens pressed through a hole in the fence, I am the only person who was there to take you step-by-step through the process of installing a set of large steel gates the Wates’ way. 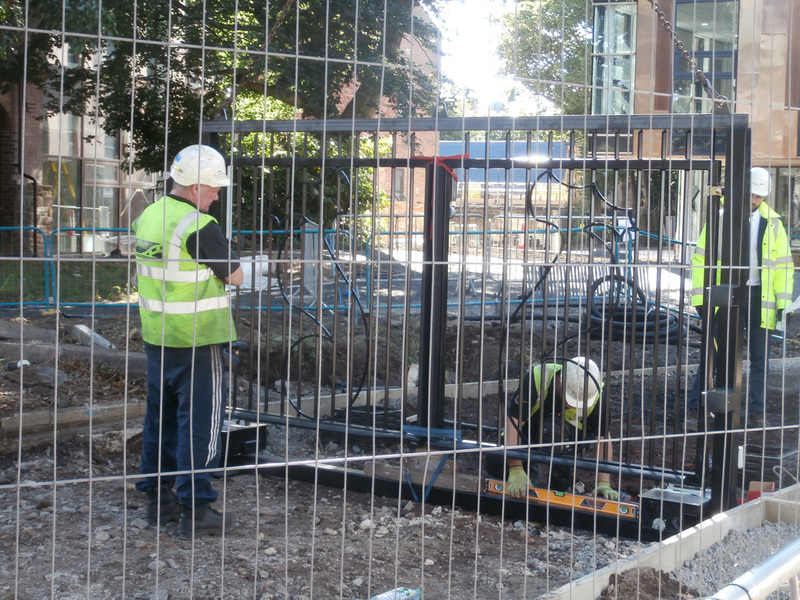 The first step, once the gates were lowered into position, was to ensure they were both completely level. Enter Spirit Level Man. By now, I had edged in as close as I dared considering I had just turned up at a crucial stage of the work. 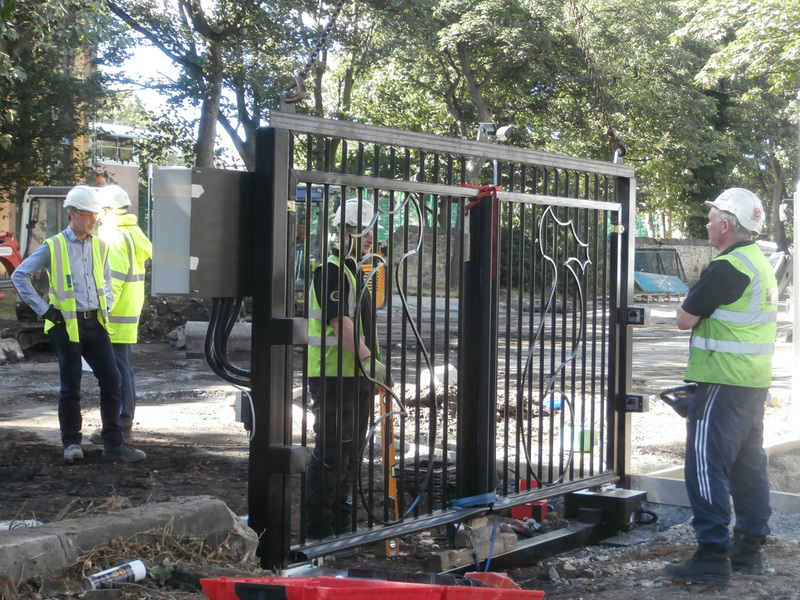 These gates, which would be one of the first things anyone about to enter the new school’s grounds would see, were the last major item to be installed on site. And I was there to record it happening. From the moment I arrived, I could see how important this job must be as Project Manager Nick White (far right) was in attendance, personally overseeing the work. By this point, Nick White had looked up and noticed I was there. He didn’t say anything. Just concentrated on the important job in hand. Through every stage of this process, Nick has never been less than warm, gracious, extremely helpful and most professional whenever I met him. Wates have a company philosophy which welcomes and embraces the ‘client’ throughout the job, so it is second nature to their workforce to be open, informative and always willing to help. I know they found it a bit ‘strange’ that our build had an unspoken expectation of very restricted access and they were ‘caught out’ by this occasionally. Hence the ‘site-shut-down’ to staff, for which I later received an apology from the member of NHSG staff involved. Only once did Nick ask me to come back another time, even though I had already been kitted out and allocated Connal as a guide. I didn’t mind. I could see the strain etched on his face at that point. And they did hit problems. Especially in the run-in to the hand-over. Privately, a number of guys told me they couldn’t see it being ready in time for us and, afterwards, I was told that Nick, “Did very well for a Young-un”. That he, “Held it together well.” A manly compliment. When Nick looked up, he was probably thinking, “Is Christine, officially allowed here now or not?” And I can’t blame him for that. At times he’ll have been told I was and on other occasions I wasn’t. But as the guys conferred, I decided this was my time to edge forward. As it was, I did now have School’s permission to be on site and since there was no boundary fence left to speak of anyway, I took this opportunity to step over the rubble to take up a reverse viewpoint. Against the backdrop of Tankerville Terrace, the ornate features of the gates were a lot easier to see. 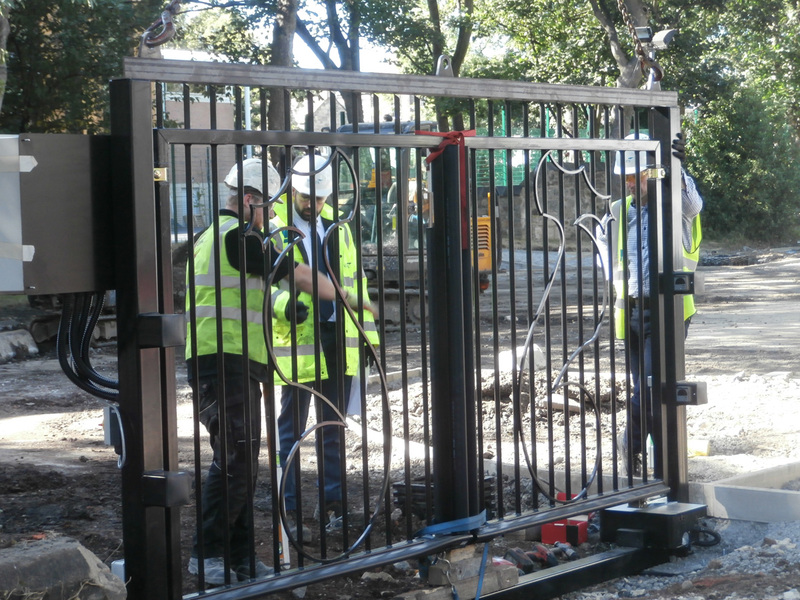 Each carpark gate featured a large seahorse emblem, of course, courtesy of GMC Fabrication Services. Not wanting to push it too far, I didn’t stay there very long. The gates may have still been held up by support chains, but I could see this was a really stressful process and I didn’t want to distract anyone. There was one of the Wates’ supervisors I didn’t recognise. Peter had said the last time I saw him “There was a new boss on the job.” And that he was a strict one too. In the photo below taken from Tankerville Terrace again, he is the guy standing on the left. I made a point of introducing myself before I went home that day. Initially a little bemused by me, Ken Fikson was to become my last site-friend. 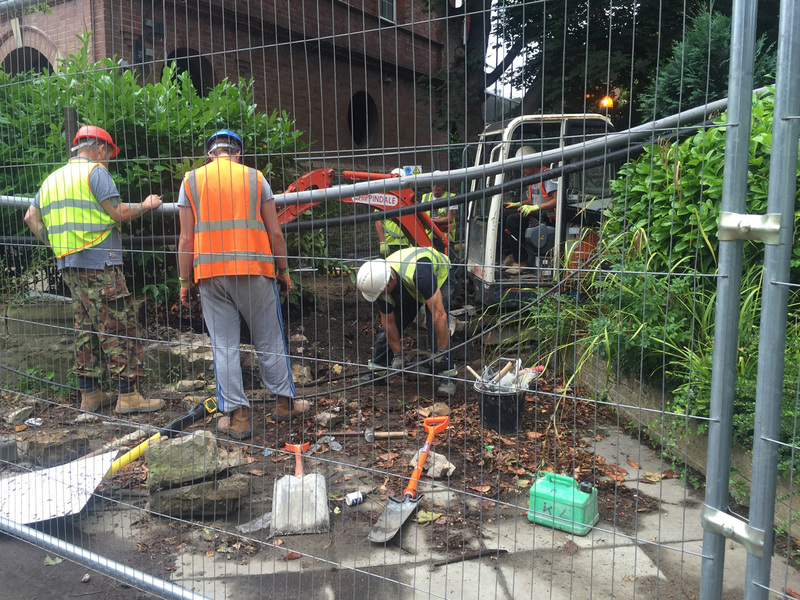 Ken Fikson (left) was brought in for the final ground works. It must have been approaching 5.00 pm by that point and, pleased with what I had accomplished, I turned away to head off for home. In order to do that, I had to make my way around the lorry again. I decided to take one more photograph from a different angle and, as I framed the shot, it dawned on me it was still carrying half its load. 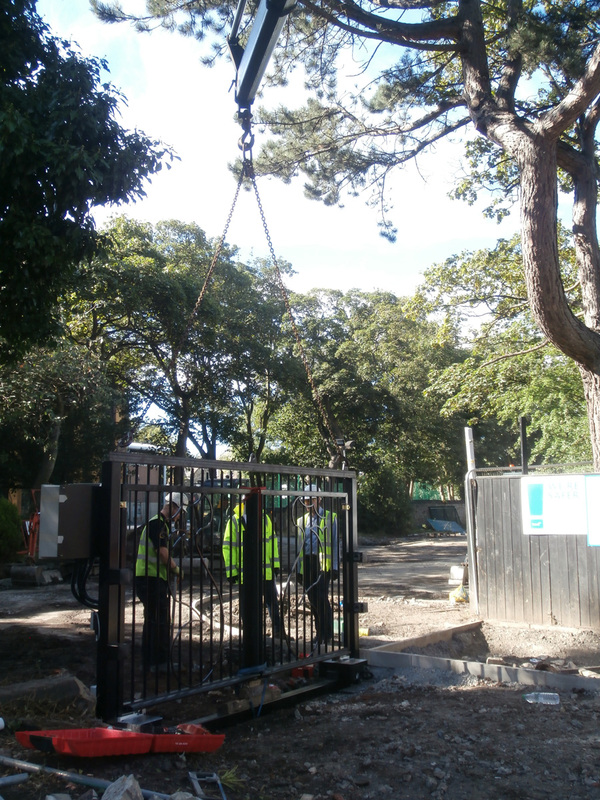 Clearly not just one gate was being delivered today, but two! Of course. 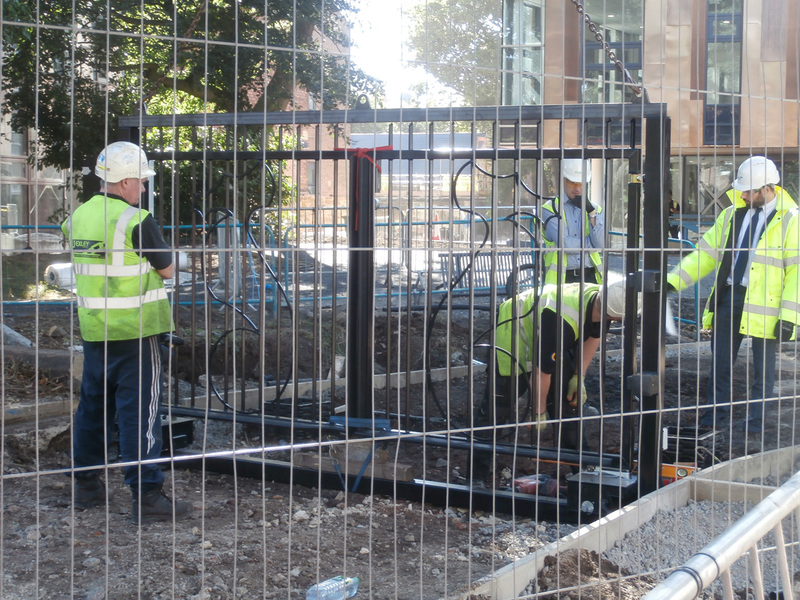 What was being put into position was a set of gates for car access and a smaller pedestrian gate had yet to be unloaded. I wondered whether they would manage to get this done that night. On the way home, my mind began to muse on purpose-built gates and later that evening I realised it wasn’t actually as long ago as I thought that one had been commissioned for the Tankerville site. Does the image below ring any bells with anyone from Church High? Where on Church High’s site is this and when was it created? 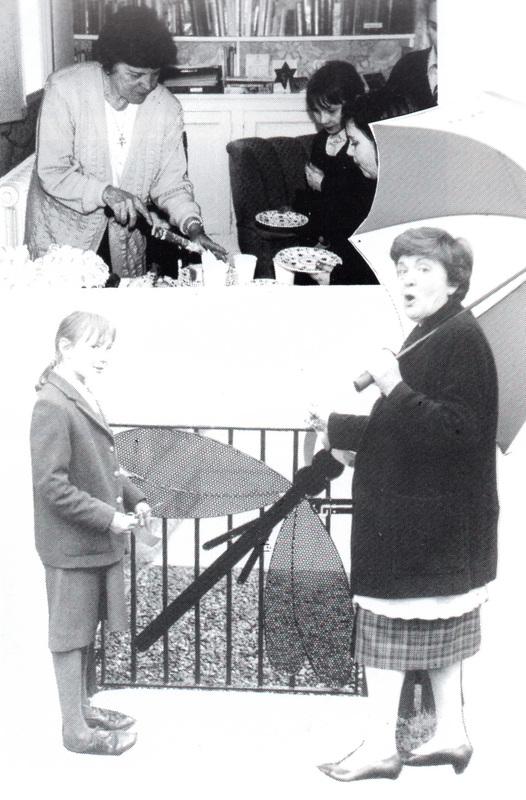 Miss Davies and girls (including the designer, Alex Levett) celebrating the opening of the School Pond in 1995. I am still in contact with Miss Davies, my first Head Mistress and someone from whom I learned a great deal. She has been helping me with the early stages of the history of Church High’s last years. She was very saddened, as I was, at the news that GDST will soon be selling Tankerville House, an iconic property which has been in Church High’s land portfolio since 1927. 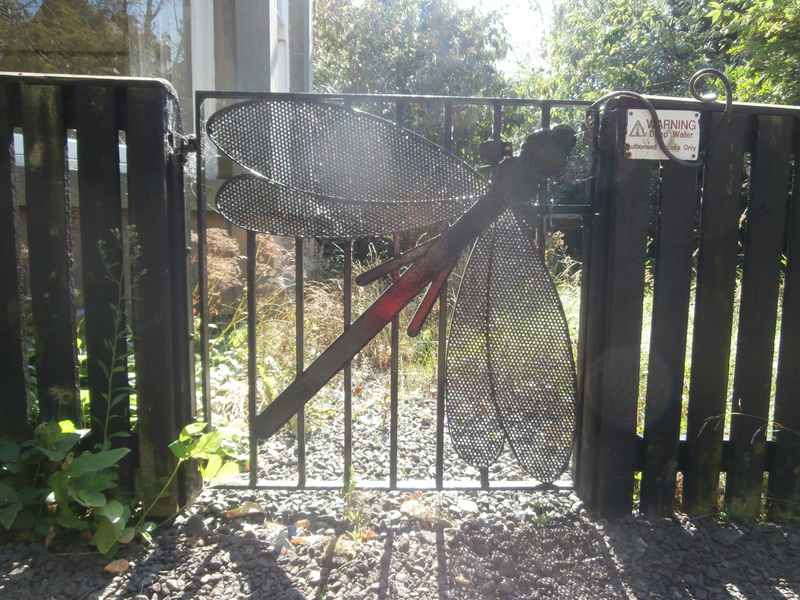 Westward House is to be retained, however, so at least Alex’s little dragon-fly gate is still safe for a while. Because a dragon-fly is often seen as a symbol of Hope. Have you ever come across a tiny book called ‘Water Bugs and Dragonflies’, I wonder? I was given a copy by my Vicar after my mother died and I am very fond of it indeed. Intended to help explain death to young children, it can also be used to minister to other losses, of course. The story begins: ‘Down below the surface of a quiet pond lived a little colony of water bugs. They were a happy colony, living far away from the sun.’ At the end of the tale, the writer provides the reader with the following prayer: ‘Thank you, God, for the miracle that makes shiny dragonflies out of water bugs. Please remember …….. who has left the pond we live in. Give him/her a good life too in a wonderful new world of sun and air. And then remember me, and let me someday be with him/her. Amen.’ This feels quite apt as we near Tankerville re-opening as a brand new school. Where would your pond be?